Drift Racing! Practice drifting, or go racing against other real people. I'm still developing the game (using GWT and WebGL4J). Any feedback would be greatly appreciated. Still to come is a track editor, and creating teams to go drift racing together. 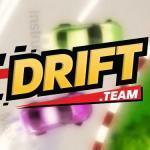 PLAY HERE >>> https://drift.team/ Happy drifting! Whether there are fresh examples for Phaser 3. It is interesting to see the implementation of physics and realistic control of the machine in the style of GTA-2. I saw a couple of examples for Phaser 2, and they are something too complicated. How rotation car by ellipsis? How accelerate? How to ride back with a realistic turn?